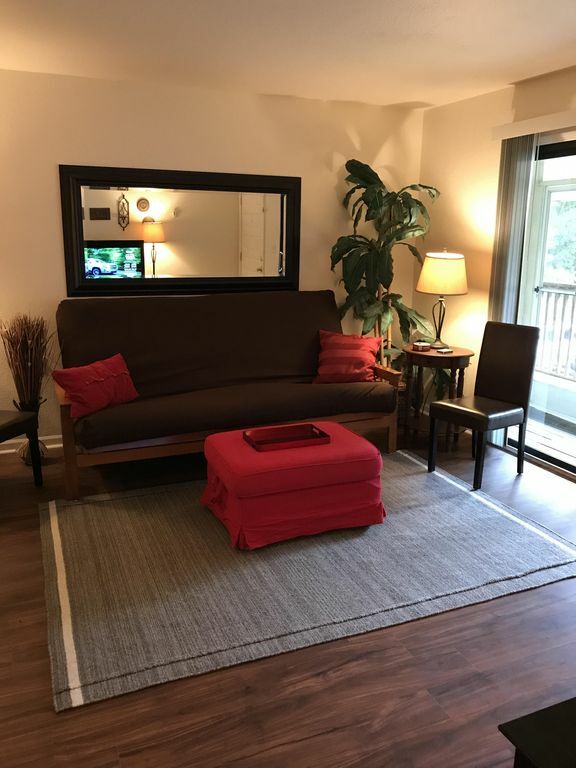 Just updated, this lovely, comfortable condo is great for your stay in Tallahassee. Everything you need is at your fingertips. 150 Mgbs wifi and 100+ cable channels. Stacked washer/dryer in the unit. New designer plank flooring and soft, cushy carpet have just been installed. Kitchen is complete with all new small appliances including coffee maker, toaster, and blender, and cookware/dishes. Enjoy cooking with gas, a microwave, dishwasher, disposal, and full sized refrigerator with ice maker. The dining table comfortably seats 4 but can also shrink 2 ways to seat 2 or 3. A new king bed has been added. 2nd bedroom has a queen sized bed. Both beds have soft, comfortable brand new bedding. Plenty of closet space throughout. Each bedroom has a chest of drawers, an ottoman for your luggage, and ceiling fans for your personal comfort. 2 desks are available if needed, but are out of the way if not needed. The bathroom has plenty of soft, thirsty towels for up to 4 guests. It has a shower/tub combo, and extra storage space above the commode and below the sink. The living room has seating for up to 4 guests, and a flat screen television. A mini ironing board and full sized iron are provided for your dress-up occasions. The screened porch has 4 chairs, a small table, and an outdoor rug for your enjoyment. On nice weather days, the sliders can be opened to the screened porch to increase your living space. Parking is convenient in “Visitor” parking spaces. It is very important to park only in Visitor Parking spots as the towing companies make a fortune on improperly parked cars throughout Tallahassee (speaking from experience), and we cannot be responsible for your towing charges. This unit is on the second (top) floor, up one flight of stairs. No noise from above! This is a condominium community with private owners. The community is quiet. Enjoy yourselves and please be respectful of noise issues. A lockbox on the front door is provided for your easy access. If Thanksgiving interests you, we will provide a turkey roaster with rack, platter, and pie plate. Rate for Wednesday Nov. 21 – Saturday Nov. 24, checking out Sunday Nov. 25 would be $700 plus taxes, cleaning and property damage insurance fees. Looking forward to hearing from you and answering any questions you might have! We have been in the property management business in various forms since 1981. We really enjoy the vacation rental business as we get acquainted with wonderful people who are traveling and enjoying themselves. We bought this condo when our daughter was a student at FSU. She lived here and loved it, as did her roommate. It is so conveniently located. We walked to games and didn't have to worry about parking or traffic. This community is less densely populated than most in the area and has gorgeous tall trees and green spaces. Just updated with new flooring, the beautiful furnishings are comfortable and chosen for easy living. The kitchen is outfitted with the things you will need for your stay. Everything is at your fingertips! Full sized with ice maker. Salt, pepper, Pam, olive oil, coffee, filters, non-dairy creamer, sugar. Flat screen in living room. This condo is conveniently located near FSU. It had all the amenities needed for our stay. The decor is very pleasant. All communication with owner was very easy. Highly recommend!!! Thank you so much, Julie! Cleanliness is very important to us. We certainly enjoy great guests like yourselves, and hope to see you when your plans bring you to this area again. Cute condo. Short Uber ride to stadium. Walkable in cooler weather. Leslie, thank you for your comments. Cleanliness is top priority for us. Thank you for leaving the condo in great condition! Weather permitting, it is an easy, flat 1.3 mile walk to the stadium. Hope you and your husband had a great visit and will come again soon! This condo is conveniently located between 3 college campuses: FSU, TCC, and FAMU. There are a plethora of entertainment opportunities at these campuses including many sports events and the FSU circus.